Reading comprehension researchers will know that the simple view of reading (Gough & Tunmer, 1986) presents reading (and reading comprehension) as a function of two factors: (a) decoding ability (D) and (b) language comprehension (LC), a composite skill that is not well articulated by the model, but that is generally understood to include vocabulary knowledge and auditory processing skills that permit comprehension of oral language too. As Paris & Hamilton (2009) discuss, the simple view falls short for several reasons. First, the equation R = D x LC suggests that D and LC should be weighted equally. Developmental research, however, suggests that as children grow, decoding and language comprehension skills will grow at different rates (e.g., Paris, 2005). The contributions of decoding and/or language comprehension to the index of reading comprehension should therefore vary according to developmental stage. Plus as Nell Duke outlined during a presentation she made to our Reading Comprehension doctoral seminar last semester (CEP 912) the simple view doesn’t take into consideration the many variables outside of language comprehension that have been shown to influence comprehension. Motivation to read, interest in the topic, genre, background knowledge about the topic, executive function, knowledge of reading comprehension strategies and the reader’s ability to apply them, cognitive flexibility, text structure, culture, reading context, the reader’s epistemic stance…all of these variables and many many others have support in the literature as correlates of reading comprehension. In brief, the simple view of reading fails to capture the true complexity of reading comprehension processes. This week, in CEP 891, a Master’s in Educational Technology (MAET) course that I’ve been invited to co-teach with Paul Morsink and Rand Spiro, we are investigating definitions of online reading. Students have been asked to respond to the following discussion prompt grounded in quotes from Nicholas Carr’s book, The Shallows: What the Internet is Doing to Our Brains. Given the empirical, theoretical and observational evidence that you’ve read and explored so far, how do you now respond to these two claims from Nicholas Carr’s book? Do you agree with these claims? Are these descriptions of online reading sufficient? deficient? or something else entirely? Please share your thoughts! 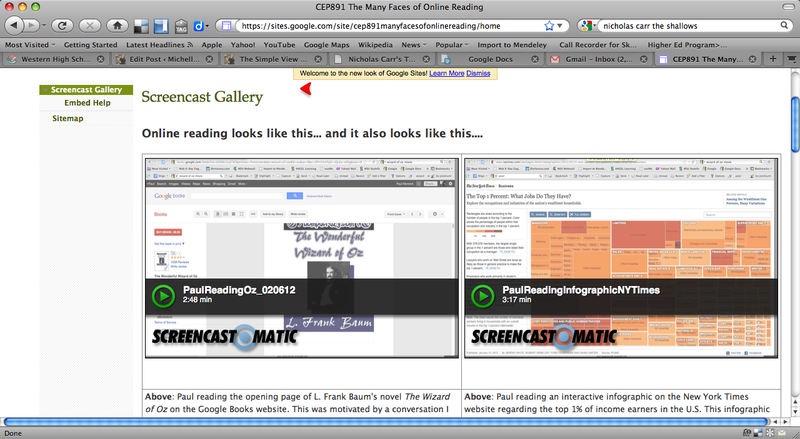 So far, several students have expressed agreement with Carr’s definitions of online reading. They agree that we are skimmers and scanners; they agree that online, we read more, but less deeply. A few dissenters, however, see that this may be too simple a view. Admittedly (though perhaps I shouldn’t be showing my cards just yet) I agree with them. I don’t disagree that skimming and scanning are hallmark online reading strategies. To me, however, reading online — a term that tends to be used in the singular — is much more dynamic and complex. Like its print-based analogue, ways of making meaning online cannot be simply defined by a such a narrow view. It’s time to push for broader, plural definitions of online reading that take into account the reader, her purpose, her context, culture, background knowledge, motivation, interest, executive function and cognitive flexibility, her understanding of internet text genres, structures and symbols. Our students will also be posting video clips of two different types of online reading as a way to see how dynamic our online reading comprehension processes are. With their permission, I’ll see if I can post links to their screencasts next week. Carr, N. (2010). The shallows: What the Internet is doing to our brains. New York: W.W. Norton. Gough, P.B. & Tunmer, W.E. (1986). Decoding, reading, and reading disability. Remedial and Special Education, 7(1), 6-10. Paris, S.G. (2005). Re-interpreting the development of reading skills. Reading Research Quarterly, 40(2), 184-202. Paris, S.G., & Hamilton, E.E (2009). The development of children’s reading comprehension. In S.E. Israel & G.G. Duffy (Eds. ), Handbook of research on reading comprehension (pp. 32-53). New York: Routledge Taylor & Francis Group. Online, is stopping or going more important? Question: Advantages of reading/writing online vs. reading print and writing by hand?